I remember the first time I cooked these Black Bottoms. It was with a friend, Gail. I couldn't believe how flavorful and moist these small treats were. They're simple to whip up and I've never met anyone who doesn't love them. They're perfect for a Christmas brunch menu. Blend together chocolate chips, cream cheese, eggs, sugar, salt - set aside. Sift together flour, baking soda, sugar, chocolate and salt. Add vanilla, oil, vinegar and water, mix well. 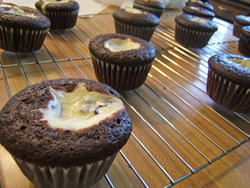 Fill small cupcake liners two thirds full with cake mixture and top with one teaspoon of cream cheese mixture on top. Bake 20 minutes. Makes 12 - 14 cupcakes.